"Yogi Berra, one of baseball's greatest catchers and characters, died on Tuesday at the age of 90. 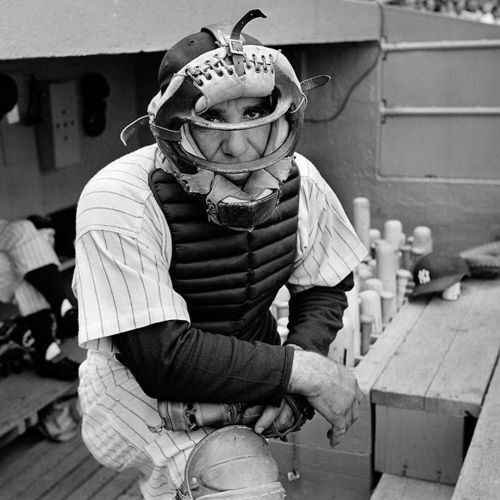 As a player, #YogiBerra was a mainstay of 10 Yankee championship teams. As a manager, he led both the #Yankees and Mets to the World Series. But he may be more widely known as an ungainly but lovable cultural figure, inspiring a cartoon character — Yogi Bear, of course — and issuing a seemingly limitless supply of unwittingly witty epigrams known as Yogi-isms. "You can observe a lot just by watching," he is said to have declared once, describing his strategy as a manager. What most distinguished Berra's career was how often he won. From 1946 to 1985, as a player, coach and manager, Yogi Berra appeared in a remarkable 21 World Series. He still holds Series records for games played, plate appearances, hits and doubles. No other player has been a champion so often. @nytimes staff photographer Sam Falk took this photo of Yogi Berra at Yankee Stadium in 1956. #⚾️" By nytimes on Instagram.